This tutorial is taken from the Adobe Photoshop CS5 Digital Classroom by Jennifer Smith. 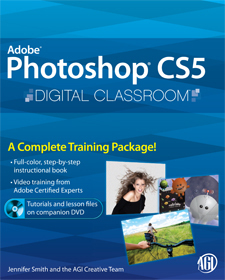 In this tutorial, you discover some of the new features of Photoshop CS5. The features that are covered are broad and include improvements that affect print, web, 3D, and multimedia designers. The features are summarized in this chapter so that you can quickly find out what's new. Don't worry about comprehending all the new features, as many of these features, as well as other workflow improvements are incorporated into the lessons. For those of you who love the power of Adobe Bridge, but don't like to exit Photoshop, you'll learn in this Photoshop Tutorial how you can now take advantage of Mini Bridge. Mini Bridge is essentially a scaled down version of Adobe Bridge. Much of the same functionality is in Mini Bridge, in fact you can not only organize your files, but perform other tasks such as batch actions and more. Use many of the features from Adobe Bridge, right in Photoshop with the new Mini Bridge. By simply clicking on Search in the upper-right of the Mini Bridge panel, you can take advantage of the Spotlight Search icon. Once you initiate the search you can change the search criteria from the Search drop-down menu. Mini Bridge includes search capabilities. Sort and rate items in the Content window by using the icons directly above the Content pane. A. Select. B. Filter. C. Sort. D. Tools. 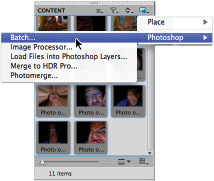 Place files directly into Photoshop, or use other tools, such as Batch Actions. Place files, or run batch actions on them in Mini Bridge. Learn Photoshop with this Adobe Photoshop Tutorial based on the book written by AGI's Adobe Certified Instructors and used in AGI's Adobe Photoshop training classes. This Photoshop tutorial is provided free of charge for you to learn Photoshop on your own and to see the quality of the Photoshop book, Photoshop training, and Photoshop tutorials created by AGI. To learn Photoshop with the help of one of our expert instructors please visit American Graphics Institute. If you are interested in buying this Photoshop training book you can buy it on-line at Amazon.com or at your favorite local book store. The team at AGI hopes that you find this Adobe Photoshop tutorial a useful way to learn Photoshop. Copyright 2012 by American Graphics Institute (AGI). No content on this site may be saved, stored, reproduced, or used without the express written consent of AGI. For information on licensing this content, contact AGI at info (at) agitraining.com or visit AGI for Online Photoshop Classes, Photoshop Classes in New York, Photoshop Classes in Boston, Photoshop Classes in Chicago, Photoshop Classes in Philadelphia, and Photoshop Classes in Orlando.